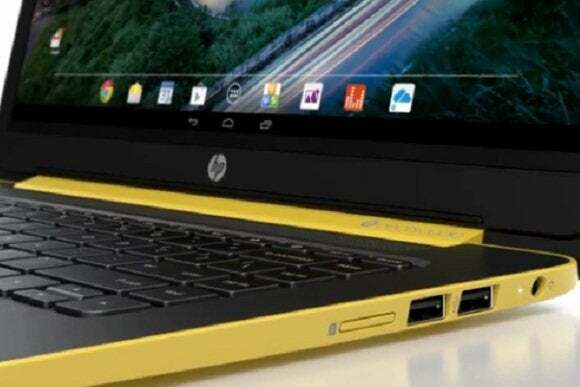 HP may be about to launch its second Android laptop, this time with a 14-inch display. No other official details are available, but Notebook Italia claims that the Slatebook 14 has a 1080p touch screen, and may have 2 GB of RAM and 16 GB of storage on board. This isn't HP's first attempt at an Android laptop. Last year, the company released the SlateBook x2, a 10-inch tablet with an attachable keyboard and trackpad dock included. But that effort has numerous issues, including cramped keys, buggy software and surprisingly weak battery life. Hopefully the Slatebook 14 can address those shortcomings. Still, users may find that Android has yet to become a capable enough operating system for laptop use. Multitasking is a chore compared to Windows or Mac OS X, with no built-in way to view several programs at once, and no taskbar for quickly switching between apps. Android also lacks the right-click context menus you'd expect from a desktop operating system, and the handling of keyboard shortcuts (such as Ctrl-Z to undo) can be inconsistent from one app to the next. Having said that, Android still affords a level of simplicity that you don't get from full-blown desktop operating systems. If the price is right, perhaps there's a small niche of users that HP's Slatebook 14 can satisfy.